So, um, every word of the Bible is true? It’s God’s word? Then especially when it says it’s actually God speaking, I guess all you fundamentalist types have no choice but to obey. Now you can either treat the Bible like the outdated tribal mythology that it is. Or you can say, Nope, it’s the word of God. Gentlemen, if your wife wasn’t a virgin when you married her, God says you gotta kill her. Sorry ’bout that. But you know, it’s in the Bible. 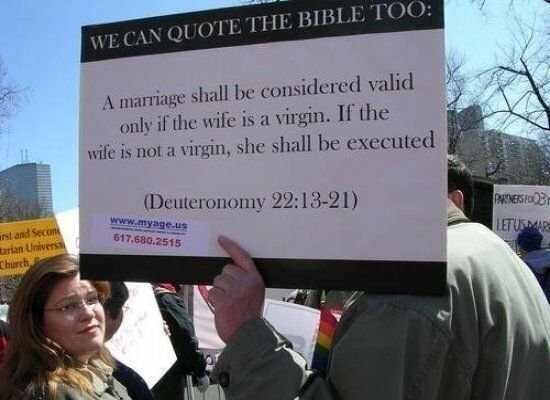 This entry was posted in Religion, Society and tagged Bible, Christianity, Deuteronomy, God, marriage, stoning, virgin. ← What’s this blog all about, anyway? Eden, Jesus’ response to the question about the greatest command was to remind his fellow Jews to recite the Shema. If you don’t know what the Shema is, go here or else read my earlier post about it. This would have introduced him to the Shema of Israel, the central creed of Judaism which affirms the oneness of God. Zoe, the theme of this blog (and of the novel) is that that is precisely what Jesus was doing – reaffirming the primacy of the Shema, for the sake of purifying Israel and expelling the Romans from the area.